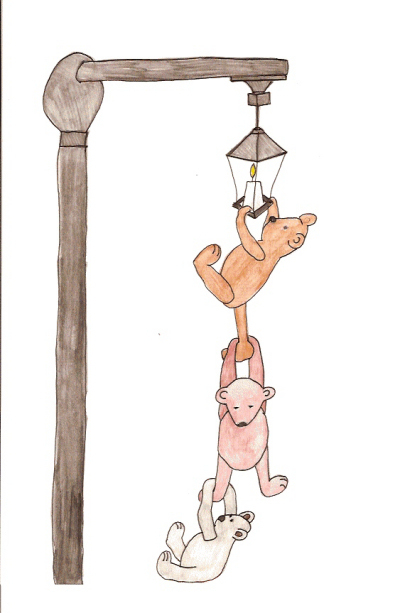 Every night the bears lit the candle in the lamppost before going to bed. It cast its soft glow on their houses and the bears felt safer having it lit. One day a new bear, Arthur, moved into town. He wasn't a very nice bear and the other bears didn't like him. He left his rubbish lying outside his door and threw his honey pots into a pile in his back garden. The worse thing about the new bear was that he didn't like to have any light on at night. When Rick went to light the candle one night, Arthur opened his front door. “Turn out that light!” He shouted so loud that Rick fell off his brother's shoulder and fell to the ground. “What shall we do?” Rick asked his brothers. So the next night Rick, Rusty and Coal went to the lamppost. Rick stood on Coal's shoulders and then Rusty stood on his. He lit a match and was about to light the candle when Arthur's door opened. “Don't you dare light that candle. I don't like it to be light at night. I like it dark.” On his way back in his house he tripped on a pile of empty soda pop cans. “I'm not going to let him bully me. Let's teach him a lesson,” said Coal. They gathered as many candles as they could find and put them on the ground all around Arthur's house. “When I lift my right paw, light every single candle,” Rick said. He lifted his paw and the three bears lit every single candle. Bright light shone in Arthur's house. The three bears didn't blow the candles out. They hid behind a tree and giggled at Arthur. “You can't make us. Every night we're going to light the candle in the lamppost. If you won't let us, then we'll light up your garden every night until you do.” Rick shouted at the other bear. “You'd better clean up this messy house too. You're a lazy slob and even you nearly hurt yourself. Clean it up or else,” Rick said. The next day Rick, Rusty and Coal went past Arthur's house. He was outside picking up all his rubbish and putting it in the trash can. That night they lit the candle. Arthur opened his door and was about to shout, but remembered what had happened the night before. He shut the door and pulled his curtains tight. The bears slept well that night, knowing their candle burned bright, casting its glow across their house.